After months of rigorous searching, this year’s top e-commerce products have been identified and now that their names are part of the finalists' list, it's time to start judging and voting on which ones stand out from the rest to honor the best 3 of Multiply Origination Awards! 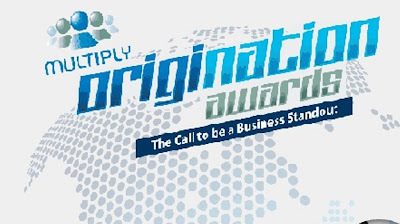 From almost 1000 nominations, 30 of the most original and creative brands and products have emerged to be a part of the first Multiply Origination Awards. Local products in fashion, food and beverage, and home and family care that available on the Multiply Philippines website have been narrowed down to be the 2012’s most outstanding brands and products and its up to us and to the judges who will take home the exciting prizes! The judges for Multiply Origination: the Call to be a Business Stand-Out are GoNegosyo Founder and RFM Corp. CEO and President Joey Concepcion; Sulit.com.ph; Co-founder and Managing Director RJ David, BDO’s Sr. AVP for E-Commerce Lending Cofa Gutierrez; Multiply.com Philippines Country Manager Jack Madrid; and Chuvaness.com founder and lifestyle blogger Cecile Van Straten. They will review these top 30 brands and products and they will judges each one of them base on strength and innovativeness of the product concept, perceived value and marketability. Chosen as finalists for their Most Original Fashion Forward Idea are the following; Honey Badger Bags of Studio Boheme, Manila Sole Shoes of Manila Sole, Cabo Feather Miallot of Soak Swimwear, Macy Satchel of The School of Satchel, Butter Tint of name of Bare Naturals, Sea Charm Bracelet of Trinket For Keeps, Customizeable Wire Hangers of Anagon Collection, The Weekend Bag of The School of Satchel, USB Camera Necklace of Tuesday Freya, and Smart Passport Folio of The School of Satchel. Identified as the year’s Most Original Gourmand Idea finalists are Chuco Portrait of Chuco Art, Enchanted Purple Hand-tied Purple Bouquet of Sweet Blooms, Paris Halloween Treat Bracelet of Sweet Blooms, Pineapple Vinegar of World Fair Trade Asia, Trigona Sugar Bag of Milea Bee Farm, Crispy Tahong of World Fair Trade Asia, Cake Clothes Line Design of Sweet Success, Decorated Cake with 3D Designs of Cake Avenue Bakeshop, Dainty Vanilla I Love You Cookies of Kela’s Kitchen and Keepers and 60% South Cotabato-Coco Regular Mini Crave of Risa Chocolate. Finally, singled out for the finalists of Most Original Mommy Management Idea are namely Hoot Hats of Honey Baby, Sniffles Balm of of Milea Bath and Body Wellness Essentials, Milea Bath and Body Wellness Essentials of Milea Bath and Body Wellness Essentials, The Mommy Patch Anti-Mosquito Rescue Sticts of Mommy Patch, BCV Tank Top of Mommy Matters, Mommy Mundo’s Mom 24/7 2012 Planner of Mommy Matters, The Proud Mama Reversible Nursing Cover of The Proud Mama Store, Momease Diaperbag Converter of Mommy Matters, Shoo Fly Insect Repellant Home Spray of INDIGObaby and Tee Hee Shirts of The Proud Mama Store. Aside from the judges’ scores, there's also an online voting for the public, just go to http://origination.multiply.com/#8 to vote for your favorite original product online. Online voting will be from December 1 to December 20, 2012 and will contribute 30% to the final score of each finalist. The three winners of the Multiply Origination Award will receive an Online Business Package worth Php200,000.00. The Online Business Package includes essential tools to promote the merchants’ existing online business, including a Samsung Galaxy SIII, a Cherry Superion Tablet, Smart Bro Pocket Wifi, a Gold Package from Sulit.com.ph worth P100,000, digital advertising and billboard exposure care of Multiply.com and more. Winners will be announced on January 14, 2013. Now, ain't 2013 is gonna be exciting? I've heard a lot of good things about these products, so I'm sure that whoever win here are gonna be so deserving. Good luck to all finalist!